It’s the 1st of June, which means it’s time for the first check in for the summer reading challenge. And guys, I came *this* close to finishing (picture me with my thumb and finger positioned mere millimetres apart). I’m currently reading my final book for the challenge. One out of twelve not completed in time! And there goes my chance of being one of the first five finishers – I mean, there are bound to be people who actually finished this month. Oh, woe is me, etc. Anyway, here are the books I actually did manage to read this month. Some you’ll have seen already if you’re a regular reader. I will apologise in advance because this post is going to be long. I’ll understand if you skip it! The Wasp Factory by Iain Banks (244 pages). I read this book on the train on a day that I actually had to go into work. Managed to finish it in a 2-hour train journey so it’s a fairly quick read. It also drew me on, leaving me wanting to find out what on Earth was going on. warning: it’s fairly graphic/disturbing and the main character is clearly a sociopath, which for some reason didn’t stop me from liking him?? My main reaction to the “twist” ending was “What the hell just happened?” It was shocking, but somehow felt like it was shocking purely for the sake of being shocking. I mean, what did the ending have to do with anything? Sorry, that’s probably confusing. You’ll have to read the book to find out what I’m on about though. No spoilers here! Anyway, 3 stars. 10 points: Read a book you have never heard of before. The Bees by Laline Paull (343 pages). I went into the train station bookshop to see if there were any books that would fit into this category, spied a book called “The Bees”, realised it was about actual bees, as in the insect, and was instantly sold. This is the story of Flora 717, a bee born into the lowest class of the totalitarian hive society. However, Flora 717 is different to other bees of her kind. The book has been described as a sort of Watership Down but with bees, but I don’t entirely agree with that. Yes, it has animal (well, insect) protaganists, but Watership Down is a different kind of story to me. Anyway, I LOVED this book. Caps totally necessary there. I’m not even sure whether I actually liked the story or am just entirely biased because bees!! Either way, 5 stars. 10 points: Read a book that has been on your TBR list for at least two years. The Kite Runner by Khaled Hosseini (323 pages). Jan has been telling me I should read this book ever since he read it, which was a lot more than 2 years ago! For some reason, I never did get round to it despite hearing good things from other sources, so this category seemed like the perfect opportunity – especially since Jan owns the book and I didn’t have to spend more money. You can read my full review here, but basically I liked it well enough but didn’t love it the way everyone else seems to, was disturbed by a few scenes and hated the protagonist. 3 stars. We Were Liars by E. Lockhart (225 pages) – won the Young Adult Fiction category. I chose this book for the simple reason that it cost less than Landline by Rainbow Rowell. To start with, this book felt like a pointless atory about a spoiled, rich teenager moaning about her petty, first-world problems. But then it somehow drew me in, mostly because it didn’t seem to make any sense and I was determined to figure out what was going on! Even after finishing it, I’m not entirely sure whether half the events really happened (other than the “main” one – I’m pretty sure that was real!). This probably has something to do with the protaganist being incredibly other dramatic and (in my opinion) not entirely sane. It was an okay book, but I’m not sure why it won the award. I’m sure there were much better YA novels released in 2014! 3 stars. The Girl in the Photograph by Kate Riordan (438 pages). I had never heard of this book or it’s author until I spied it in the bookshop! Also,I found the title quite misleading – there is a point early on in the book where the sort-of main character (there are 2 stories each with their own protagonist) says to her mother “That’s the girl in the photograph”. However, the “girl” the story is about is not actually the one in that photograph! To be honest, I’m not sure which photograph is being referred to! Basically, this is the story of two people – Alice, who finds herself unmarried and pregnant in 1933 and is sent away to have the baby so there won’t be a scandal – and Elizabeth, the wife of a former owner of the house Alice is sent to, who nobody talks about. The blurb says of Elizabeth that her “only trace remains in a few tantalizingly blurred photographs”, so maybe she is supposed to be the “girl”? The story was quite good and gave some interesting insights into attitudes towards mental illness and illigitimacy in past times. However, I felt like there wasn’t enough distinction between the two time periods – it was only the events and characters that made me realise I was currently reading Alice’s or Elizabeth’s story. Another three star read. Tomorrow, When the War Began by John Marsden (276 pages). I bought So Much to Tell You by the same author from a second hand bookshop when I was about 14 or 15 – I think it cose me around 30p! Since then, I’ve read it at least once a year and cried every single time. I had heard the Tomorrow series is also good and bought the first in the series, but hadn’t read it until now. This book could also have worked for the “series with at least four books” category – there are seven! Which means I have another six books to go. In this first book, seven Australian teenagers go camping during the school holidays. When they return a week later, they find their houses empty and their pets starving. As I’m sure you can guess from the title, they quickly realise that their country has been invaded. Ellie (the narrator) and her friends face an impossible decision: they can flee to the mountains and try to survive or surrender. Or they can fight. Obviously they don’t choose the surrender option, otherwise there wouldn’t be much of a story 😉 I really enjoyed this book. John Marsden somehow does an excellent job of getting inside the mind of a teenage girl and the dialogue between the characters always felt real. I even enjoyed the little romances that started to blossom between the teenagers – even though that’s something that tends to annoy me in YA distopian future novels (this is not a distopian future novel though, it’s a survivalist story set in the present, which at this stage is actually the past). My only minor criticism is that the book hasn’t aged too well – it’s set in the early 90’s (when it was written) and I’m not sure how well today’s teenagers will be able to relate to it. Examples of things that clearly date it: one character has a walkman and someone receives a fax. As I said, that’s a minor criticism though – John Marsden wasn’t to know that the future would contain MP3 players and smartphones! I thought this was a great introduction to the seires and gave it 5 stars. Can’t wait to see how it continues! Light Shining in the Forest by Paul Torday (344 pages). This book could have fit into a few categories – it’s entirely new to me and I’d never heard of the author (although once I started reading I saw that he also wrote Salmon Fishing in the Yemen, which I at least knew was a film). However, the reaon I initially picked it up was because it had “light” in the title. The story is that Norman Stokoe, who has spent his life climbing up through the ranks as a civil servant, is mad “Children’s Czar” and sent off to North-East England. Then two children go missing (there is also a third missing child who is important to the story, but he went missing before the book begins). Norman, who has spent his career being “strategic” rather than “operational” (i.e. doing as little as possible! ), is forced to get involved when a campaigning journalist and distraught mother find out about his title and start pestering him. So, on the face of it it sounds like an interesting story. A bit of a mystery and a chance to address the issue of missing chlildren. I also found the North-East setting interesting – alot of it takes place in Kielder Forest, for example, it was nice to read about familiar places (also I am sick of all the British books I read being set in London!). The bit that lost me was the introduction of religious overtones and vague references to miracles/the second coming. Sorry if you consider that a spoiler but personally if I’d known about that before buying the book I wouldn’t have bothered! The author also breaks the cardinal rule of writing – so much telling instead of showing! And so many explanations! I know what “bait” and “bairn” mean, thank you very much – although I suppose that it was necessary for readers who aren’t familiar with the Northumbrian dialect. I did read the book to the end because I ended up caring about the children an wanted to know what happened to them, but I wouldn’t read it again. Two stars. The Little Coffee Shop of Kabul by Deborah Rodriguez (375 pages). This is chicklit pure and simple, but it’s chicklit set in Afghanistan which at least makes it a little unusual. If you’re looking to get to know Taliban-conrolled Afghanistan and all the evils of war, this is not the book for you. But if you just want a quick beach read go ahead and pick it up. my full review is here. Three stars. The Testimony of the Hanged Man by Ann Granger (327 pages). I picked this book up because the title intrigued me, then I saw that it was the fifth book in a series. The shop didn’t have book one of said series, so I bought this one based on the blurb. The story is that Inspector Ben Ross is called to the police station late one night to hear the testimony of a man who is about to be hanged the next day. He reveals that he witnessed a murder 15 years ago. Inspector Ross is initially not allowed to investigate, but his wife, who has a talent for inofficial detection (so says the blurb) take a trip to Somerset House and then to Putney Heath, where they discover information that convinces them that a murder really did take place. by this time, the witness has been hanged, but Inspector Ross is finally allowed to investigate anyway. This book sounded so, so good. A perfect Victorian murder mystery – no modern-day technology to help, just good old-fashioned detection. And a Miss Marple type (only younger) to help things along. But (you knew there was a but, right?) somehow the story felt a bit… flat to me. There seemed to be something missing and it just didn’t draw me in. I probably won’t bother with the rest of the series. Disappointing. Three stars. 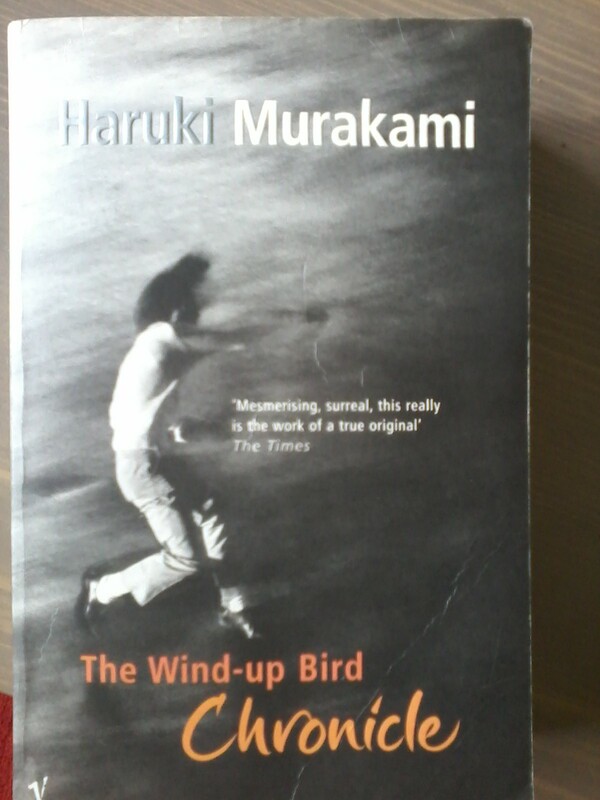 The Wind-Up Bird Chronicle by Haruki Murakami (606 pages). Thanks for that one, Kristen!! I was so confused by this book. Parts of it were good, parts of it were just weird and most of the time I had no idea what the protagonist was even doing! Obviously I’m not philosophically minded enough. Full review here, and three stars. 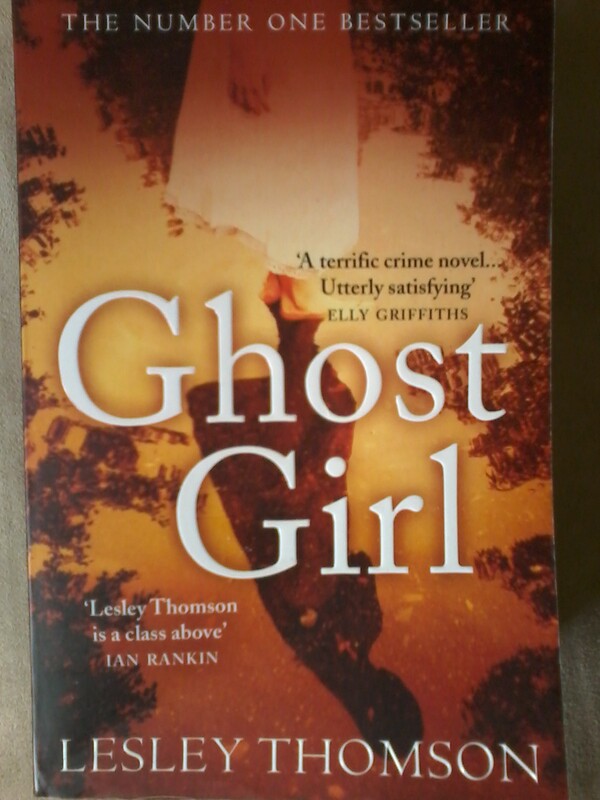 Ghost Girl by Lesley Thomson (466 pages). This is the second book in a series, but the first didn’t work for the category (The Detective’s Daughter – stupid the!). It took me a while to get into this one, possibly because I didn’t know the characters already from the first book and found them confusing. I ended up getting really into it though. I especially enjoyed the parts that took place in the past and were written from the perspective of a young girl – the author did a really good job of getting into the mind of a child. I didn’t guess whodunnit either or figure out the relationship between two of the characters. Full review here. Four stars. So, that’s 180 out of 200 points (grrr!). And now I have a month to finish reading The Life of Pi. If you actually made it this far, you deserve a medal!